Eternal Anchor exists to provie a loving, stable home for children with special needs where their physical, emotional, and spiritual needs are met and where they are assisted in reaching their God-given potential. 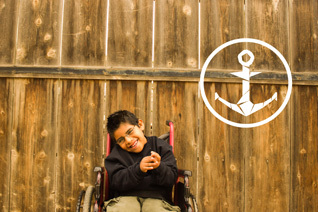 Eternal Anchor is a ministry in rural Baja California that is dedicated to serving children with special needs. Our mission is two-fold: we provide a fulltime home for children with special needs who are orphans or whose families are unable to care for them, and we provide an outreach ministry that serves the families with special needs children in the community. At our home, we give the children a loving, safe environment where they receive the care and affection they need. Our passion is to show them the love of God and to help them reach their God-given potential. We also believe that children with special needs should be celebrated by their families and that whenever possible, families should have the resources and the training to be able to provide a quality home for their own children. As a part of our outreach ministry, Eternal Anchor works with physical therapists, doctors, nutritionists, and special education teachers to help teach families of special needs children how they can best care for their own children. All children have been created by God and should have the opportunity to grow up in a safe, healthy, and loving home. Help us in this cause by donating to Eternal Anchor. Your contributions will help make a difference in the lives of these beautiful children.